Many of my most popular designs are now directly for sale in my online shop, the procedure described here concerns picks customised for individual players. The picks are crafted individually taking into account the anatomy, playing preferences and esthetic tastes of the players. This process results in a true custom pick, one of a kind and truely ‘your’ pick. 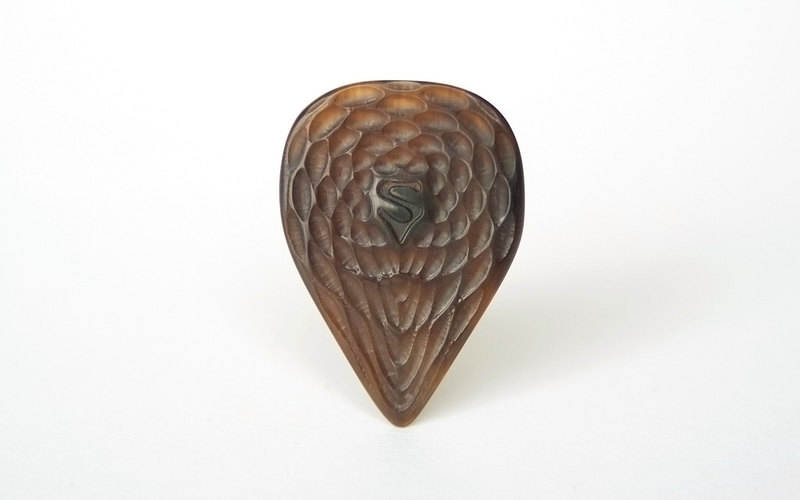 The initial cost covers the whole process of designing and computer modelling of your pick but after the initial crafting of the custom picks the same design can then be always re-ordered at a significantly reduced price. Included in the initial price is a nice wooden pick box. The best starting point for ordering is always to send me a list or pictures and dimensions of some of your favorite picks and answer a couple of short questions. This will give me most of the parameters i need to choose one or several of my designs suited for your needs and adapt them for your fingers and playing style. A good process is also to send me one of your favorite picks that you’ve been using for a while. The wear on the pick will tell me a lot about how you play already and i can match any gauge/feel more easily. You can then optionally get a prototype which will only be finished on the playing edges and give you the possibility to test the design and then request adjustments to the shape/size/gauge to fine-tune it perfectly. After that (or if you want to skip the prototype stage) i’ll usually make a set of 3 final picks of the chosen design for you. Small adjustments to the design of re-ordered picks are usually included in the reduced price so you’ll be able to fine-tune your design even more over time. stiff, medium or soft picks ? thick or rather thin ? How much do you play (h/day or h/week/month) ? do you play aggressively or softly ? personalized decoration/engraving (initials/band logo) ? With that information i would recommend one or several of my designs and materials best suited for you to choose from. Once we agreed on a design i will need a bit of info about your finger size and how you hold your pick and what exactly you want from the pick, some people have specific problems they want to address and different people have different likes/dislikes in terms of tip shape, flex, grip texture, shape, size .. etc. This will allow me to spec the size and ergonomic adjustments so the pick will ‘feel right’ in your hand. If you want to personalize the decoration of the pick (engraving or artwork with logo) you can submit ideas/pictures/sketches and i will see how they can be adapted. 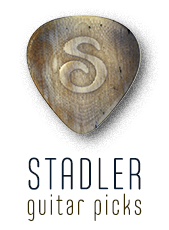 At this point however not everything is possible, the point of my pick designs and the complicated manufacturing process is to make the best possible picks in terms of playability and sound so there is a limit to what can be done in decoration (especially with typography) without compromising the playing quality of the pick. You get the final quote for the pick(s) in your order. If you want to go ahead and order you can then pay either via Paypal or bank transfer. Since this is now a custom pick order to your personal specification I do not currently offer a money back return policy once you have paid. Once I received the payment your pick(s) go into production and are usually shipped within a week. For gifts there are usually two options: a pre-made pick (or set of picks) or a gift voucher for custom picks. If you’re not a player yourself and are wondering which pick style to get I will help you to figure out what kind of pick would be a good choice. If you want it to be a surprise, get in touch and ask for ‘the stealth guide to pick gifting’ … this will help you if you don’t want your loved one to know something’s up when you suddenly start taking an interest in guitar picks. Contact me through the ‘Get in touch’ link if you have any questions, to enquire about availability or to start the ordering process. Thank You for your interest in my picks !! !